The two villages are connected by a long staircase, built during the age of Amalfi republic. This had been the only connection from the sea to the mountains, for a long time. 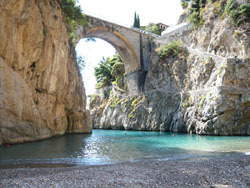 The fjord of Furore can be reached by the S.S. 163 from Amalfi to Positano (Amalfi coast drive). The fjord is right after the “Emerald grotto" entrance on the road. The church of S.Elia, built in the XIII century, where you can see a triptych of Angelo Antonello da Capua. Long time ago fishermen lived the village by the sea, but this was later forsaken. Today they're still trying to get the place back. Ruins of a paper mill, and of an old mill can be found here.